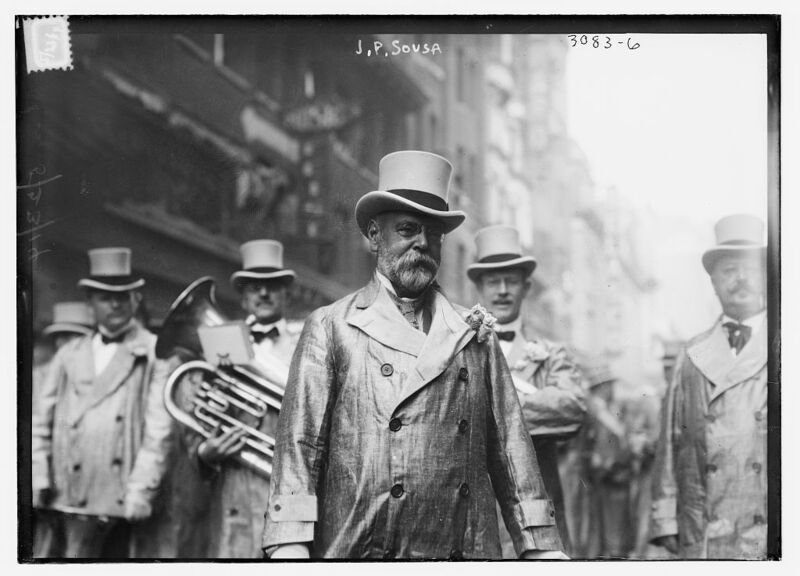 John Philip Sousa in front of a marching band in 1914. Across the country, most if not all other classical music ensembles and concert bands that present outdoor concerts will also perform Sousa. Lots of people will hear Sousa marches. One can’t say for sure how many of those people will actually listen to them — Sousa is taken for granted, these days — but they’ll hear them. Back then, marches, which we think of as merely martial or patriotic, were something different than they are today. Sousa’s marches were pop music. When a new Sousa march was published (he wrote more than 130), they were released in many editions, for large orchestra and small orchestra and band, but also for solo piano, piano four hands, for cornet and piano, banjo and piano, two banjos, guitar and mandolin, two zithers, etc. In other words, in the days before recording became widespread, and people still made their own music at home, for amateur musicians. It was also the time when every town in the country had a band (there were an estimated 10,000 bands in the U.S. in the late 19th century) and when, in fact, a march wasn’t just a march, but a kind of dance. (A wonderful illustration of what dancing the march must have been like can be seen in John Ford’s Western “Fort Apache,” in which Henry Fonda leads the men of the outpost and their wives in a march at a fancy dress party indoors.) “The Washington Post” — written for the awards ceremony of an essay contest for school children sponsored by the newspaper, nothing “martial” there — became such a hit when danced to the two-step that thereafter the dance itself was often called “The Washington Post,” whether it was danced to the march or not. The music remains extraordinary and, it seems to me, retains much of the power and charm that it must have had for the original audiences. This may be a remarkable thing to claim, but there isn’t much if any popular music composed in the 1890s and early 20th century that can still move a modern audience in the way that a Sousa march can. “Stars and Stripes Forever” was written in 1897 and yet a vast majority in our summertime audiences can probably hum along with it from beginning to end. 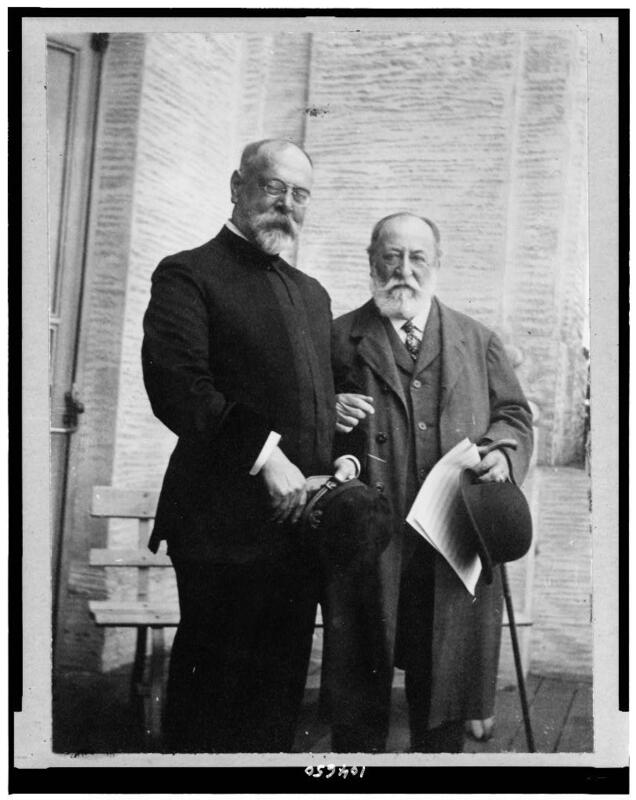 Which is to say that Sousa was a great writer of melodies, but not only that. The rhythmic vitality of his marches and their harmonic structure lend these melodies an inevitable feeling — you can almost hear the end of them when they start, as when you hear the rhyme coming in a poem. One can pick out great melodies in Sousa, just as in Beethoven and Tchaikovsky and Gershwin. All the melodies in “Stars and Stripes” are great, but especially the third one (the trio). Likewise, the trio sections of “The Washington Post” and “King Cotton.” Perhaps the first melody in “Manhattan Beach.” One could go on. At any rate, the melodies are eminently memorable. 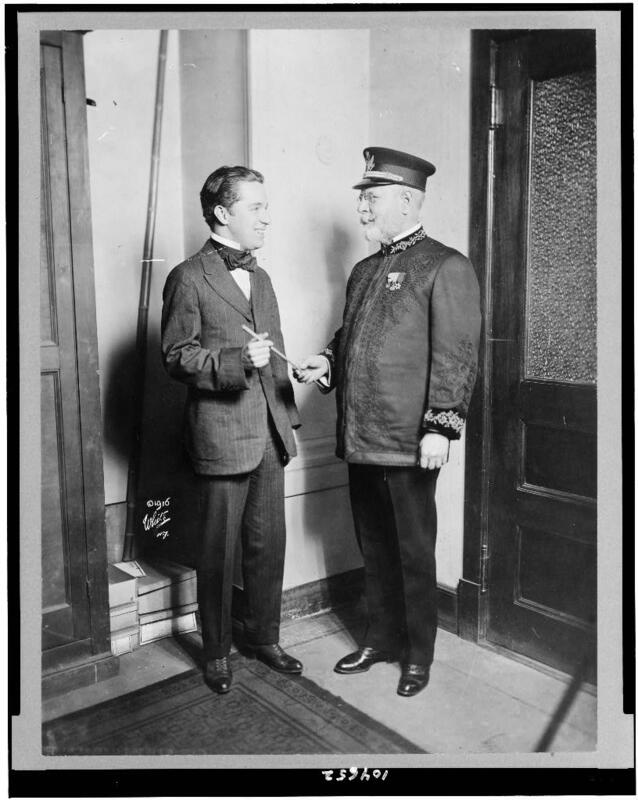 Come back to a Sousa recording after a long time, and you’ll be surprised how much you remember. And there are few things more musically satisfying than a Sousa countermelody. They seem to intertwine so perfectly with the main melody as to be yin to the yang. Sousa no doubt knew how good he was at it. In “Stars and Stripes” he sets up the trio section in such a way so that he can add not one but two countermelodies (the one for the piccolo being the first and the one for the trombones the second). In “Semper Fidelis” and a couple other of his marches, he creates a section where he can add a layer at a time, like stacked fanfares. It’s possible that some of the countermelodies are even better than the melodies themselves. Listen to the first strain of “The Thunderer” and when the countermelody comes in on the repeat decide for yourself. In terms of recordings, there are several to recommend. It is hard to beat the longtime favorites in this repertoire, the Eastman Wind Ensemble led by the estimable Frederick Fennell. Their recordings of a large sampling of Sousa marches for Mercury remain unsurpassed for vividness and verve. The United States Marine Band is currently recording all the Sousa marches in chronological order as part of their new edition of the scores. The recordings, scores and parts are all available for free download on the band’s website. I’ve been listening to Volume 3 of the recordings, which begins in 1889 with “The Quilting Party” and goes through to 1898 and “The Charlatan.” These are done with enormous style and warmth, and the Marine Band gets extra points for some truly exquisite soft playing. The digital recordings also highlight Sousa’s under-appreciated talent for orchestration. My longtime favorite Sousa recording, however, was made in the 1970s for the Nonesuch label by an unlikely ensemble: The Czechoslovak Brass Orchestra led by Rudolf Urbanec. The marches are performed here with such exuberance and feeling (and also a keen ear for the whirring rhythmic motors that make these marches go) that one can’t help thinking that these musicians, trapped behind the Iron Curtain, were dreaming of freedom all the while. This entry was posted in classical music, Video and tagged audio, John Philip Sousa, marches by pacificsymphony. Bookmark the permalink. Thank you for telling me about my country and music that I was not aware of. Happy the PSO is doing “Hands Across the Sea” as it’s a favorite of mine. I also quite like two of the more obscure ones: Powhatan’s Daughter and Kansas Wildcats. Kansas Wildcats was his last march, wasn’t it? I wasn’t sure so I looked it up. Indeed, it was written a year before he died including these marches I’d never heard of: “A Century of Progress”, “The Aviators”, and “The Circumnavigators Club”. Plus a song called “Annabell Lee” based on a poem by Edgar Allan Poe! And don’t forget the “George Washington Bicentennial”! Thank you for a wonderful article, Tim. As always, filled with unique insights and factoids. Reading this reminded me of a memorable night at the Chautauqua Institute (NY) in the early ’70s, billed merely as “An Evening with Meredith Willson”. And that’s what it was – Willson (in his 80s, I’m recalling) sitting alone on stage reminiscing about “The Music Man”, of course, but also hilarious stories about his career as a free-lance flutist in New York and several years of playing piccolo with the Sousa Band on tour. Speaking of the S & S piccolo part, on a few occasions when I was conducting the march, I would borrow a tuba from one of the band members and play the piccolo counterpart on tuba. It was a mean trill at the end, I can tell you!